Burns Honda car dealership in Marlton recently presented The Cooper Foundation with a check for $5,000 in support of Pink Roses Teal Magnolias to benefit cancer care and research at MD Anderson Cancer Center at Cooper. 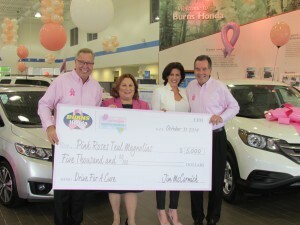 The money was raised during the dealership’s Drive for a Cure event that took place throughout the month of October. McCormick, along with Josephine McGinnis, breast cancer survivor, MD Anderson at Cooper patient, and Pink Roses Teal Magnolias co-chair, and Ron Jaworski, NFL Analyst and former Philadelphia Eagles quarterback, presented the check to Susan Bass Levin, President and CEO of The Cooper Foundation. This was the first year for the Drive for the Cure event but McCormick said it was such a success that they are already making plans for next year. Pink Roses Teal Magnolias supports innovative breast and gynecological research and clinical programs at MD Anderson Cancer Center at Cooper University Health Care in Camden. To learn more about Pink Roses Teal Magnolias, visit http://foundation.cooperhealth.org/pinkandteal. For more information on the Drive for a Cure event, go to www.burnshonda.com/drive-for-a-cure.htm.